Your swimming pool gets exposed to a lot of water, chlorine, and general wear and tear over the years. At its basic, a swimming pool is a hole in the ground with water fixtures and a pool finish. The swimming pool finish prevents water from seeping into the ground through the concrete shell because concrete is porous. 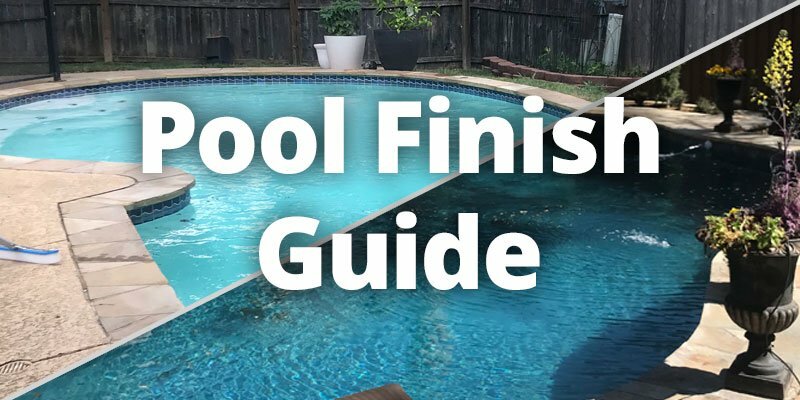 You have several options when choosing the right finish for your pool. Each of these different materials has its appeal whether it’s appearance, durability, or grip. In this post, we are going to give you a pool finishes comparison. If you are wondering how much it cost to resurface a pool, we have created a pool resurfacing calculator to give you an estimate of the popular pool finishes. One of the oldest and cheapest options is a plaster finish. Although plaster has fallen out of fashion in recent years, it is simple and cheap in appearance. Plaster finishes have been around as a pool finish since the 1960s. To make the water look appealing, you even see plaster dyed as a bright blue color. It’s among the cheapest options when redoing your pool finish. It can cost around $4.00 per square foot. 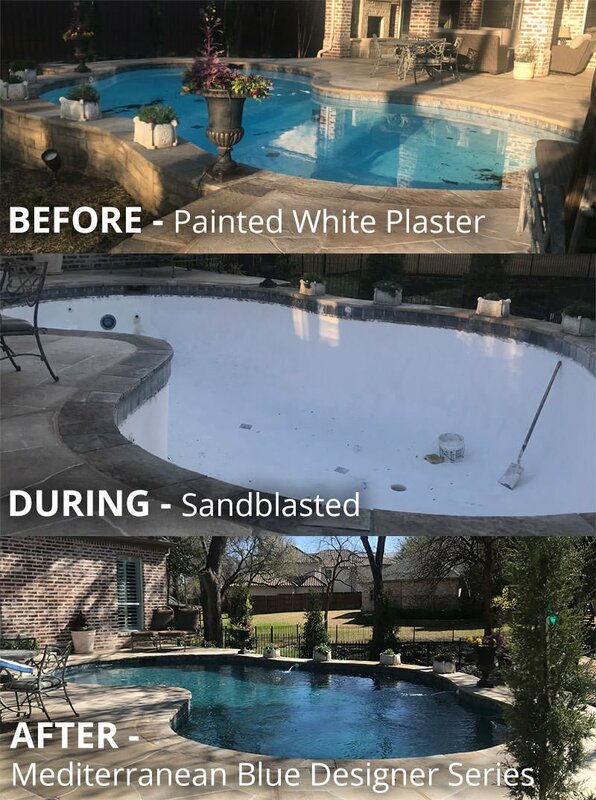 If you have a large pool, are on a tight budget, or simply like the appearance of plaster, then white plaster might be your best choice. One good thing about plaster is that it comes in a variety of colors and gives your pool a smooth, classic look. Even though most people opt for light blue to make their pool water look like the Caribbean, other options can include beige, dark blue, gray, or red. The plastering company will create the colors with different chemicals added to the mix. The drawback to using dyes is that it can make any mistakes more visible; whereas lighter colors hide such stains at first. The problem with white plaster is the same as with anything white in home decoration: stains and discoloration as a result of natural wear become apparent more easily than in colored plaster. White plaster is subject to the ravages of time more than aggregate or tile finishes. You can expect about a 7-10 year lifespan for a single plaster finish; more, with proper care. That means acid washing at regular intervals and careful monitoring of your pool’s pH balance. Plaster is also porous like concrete, so over time, you’ll begin to notice some flaws. Different types of pool plaster alleviate this problem. The first 28 days after a finish is applied, you should notice the majority of issues that might occur. The plaster and gunite mixture begins reacting chemically with the water. Of course, this is true for a basic plaster finish; modern manufacturers have introduced chemicals called pozzolans that mitigate some of the problems with plaster. Calcium hydroxide, the main component of plaster, is the weakest link in the compound and what usually causes plaster to degrade and separate from the pool shell. Pozzolans introduce silicon, which makes the plaster mixture less chemically active. Of course, this costs a little extra. An exposed aggregate finish combines elements of plaster finishes with standard aggregate. Where standard aggregate finishes use concrete as the main component, this type embeds pebbles directly into the plaster, giving it a far rougher texture. It can feel like walking on the bottom of a creek bed, but that can work for or against you. Those with sensitive feet might not appreciate the rough texture an aggregate finish provides. It looks pretty if you want a natural aesthetic, but can be rough on the feet when you’re dealing with larger pebbles. An exposed aggregate finish is more durable than plain plaster but not as durable as a polished aggregate. An aggregate pool finish represents the next level of luxury after a plaster finish. As the name implies, it consists of an aggregate of materials, usually ground and sanded river pebbles. They are crushed and mixed into concrete. River pebbles create a nice-looking pattern that plaster just can’t replicate. You can get different sizes and colors of pebbles that create a truly striking pattern. Among pool owners with a larger budget and desire to make an impression, polished aggregate finishes have become more popular. The elements of the finish are coated in ceramic to increase durability and smooth it out. It’s easier on the feet but may not look or feel as authentic. If you’re just wanting a basic walking surface and don’t have to worry too much about costs, you’ll want to use this finish. It can cost up to $5 per square foot. Aggregate finish, when combined with chemical dyes, can create a striking range of colors that rival plaster. Pool remodelers apply the finish by sandblasting the old finish away, reapplying the gunite coating to your pool shell as necessary, pouring the concrete/pebble mixture into place, then smoothing it out to create an even coating all the way around the pool interior. The problem with polished aggregate, especially if you also use it for the pool deck, is that it needs to be resealed more often that you would need to replace plaster. Aggregate finishes are also called pebble finishes. Stepping up in luxury, we’re looking at tile finish. Tile is applied differently than the other two types of finishes. Rather than pouring in a mixture and smoothing it over, this type of finish consists of a collection of hand-applied tiles that can create attractive mosaic patterns or dazzling displays of color. Tile can cost upward of $10 per square foot. As you might expect, tile takes the longest to install, so you might want to set aside a couple of weeks during which you don’t expect to use the pool to complete the remodeling process. You can choose from four basic types of tile. Each of these types is made of different materials and can achieve a different look for your pool. You can choose from ceramic, stone, quartz, and glass, going from least to most expensive. You can also select different tile sizes. Smaller tile sizes let you create an image with more resolution, so to speak. The most common are 1-inch, 2-inch, 3-inch, and 6-inch squares. This is your most basic tile. It can be glazed or left exposed; the difference is similar to that between exposed aggregate and polished aggregate. It has to do with the way light reflects off the tiles in the water. Unglazed tile creates a more natural look that can blend well with any surrounding landscapes. Glazed tile, on the other hand, works well at creating a single surface color or display. It doesn’t look as natural, but if you just want a static image in your pool, then glazed tile might be the way to go. The glazing adds an extra layer of waterproof protection. Even if the tiles aren’t glazed, they are fairly waterproof, and you don’t have to worry about your pool leaking. Stone tiles provide, without a doubt, the most natural look for the bottom of your pool. These tiles are made similarly to aggregates, with a blend of regular-sized pebbles and small pebbles. This type of tile has a rougher texture than ceramic, so you should take into account how you want the bottom of the pool to feel. Stone tiles can also come in different colors, depending on the source of the pebbles. If you’re trying to go for a more abstract or customized look, the stone tile may not be the best option. Most options come in blues, greens, and similar colors. PebbleTec has been in existence for over 25 years. StoneScapes is somewhat newer. Both technologies offer a similar lineup of products based on the size of the pebbles you want to use: you get a regular-sized pebble, a small one, a mixture, and a glass-like finish. The materials used and the process they follow are virtually identical based on what we’ve seen. Pebble-Tec has a more solid reputation because they’ve been in business longer. They also charge slightly high prices because of their reputation. PebbleTec has quarries all over the world, so they can get a larger variety of stones to use. StoneScapes doesn’t offer the same level of versatility. All four of their lines – Regular Pebbles, Mini Pebbles, Puerto Rico Blend, and Touch of Glass – seem to have the same basic appearance. If you want the versatility of design, go with PebbleTec. If you want a lower cost, go with StoneScapes. Quartz tiles are made of a blend of crushed quartz, white cement, and pigment. If you’re using quartz on your swimming pool, you’re making it look top-of-the-line. Quartz crystals, when in the light, create a shimmering finish that does an excellent job at refracting summer sunlight. Most of the time, your quartz tiles are going to have blue or a teal pigment to accentuate the color of the water, but you can increase that amount to give the pool a deeper-looking hue. It depends how you want to have your pool look when compared to surrounding features of your backyard. Tile, under normal circumstances, shouldn’t ever need to be replaced. The only time you should need to replace a tile is if something breaks it. Glass is heat-resistant and UV-resistant, making it an excellent choice for a swimming pool finish that has intricate colors. The colors will not bleach in the sun. However, you have to be extremely careful with glass tile. If broken or improperly installed – well, you’ve got essentially broken glass at the bottom of your pool, so you can figure out what would happen. However, glass tiles allow a far greater variety of colors, shapes, and patterns than other types of tiles. Most pools are rectangular, which makes it easy for other tiles to cover the entire surface, but what if your pool is curved? You need to have a type of tile that can be shaped. This is where glass tile comes in handy. Plaster finishes are the cheapest and easiest to install, but they lack durability. Aggregates can be the most attractive but are slightly more expensive and more time-consuming. Tile finishes are the most expensive and take the longest, but their durability is top-notch. The decision of which to choose depends on your budget and the look you want to achieve. If you have any questions about pool finishes or would like a free estimate, contact Willsha Pools today!